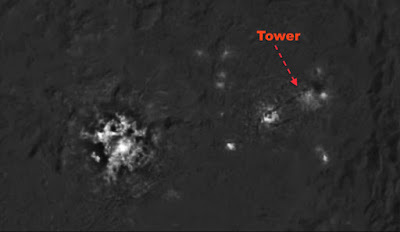 A top online UFO researcher says that an alien “tower” on the asteroid Ceres has emerged from close analysis of a NASA photo of the mysterious “bright spots” on the surface of the celestial body classified by the space agency as a “dwarf planet.” NASA has remained both fascinated and mystified by the bright spots that were first noticed in photos from the Dawn space probe inside an area that scientists have dubbed the Occator Crater. A NASA video using composite, 3D images from the Dawn spacecraft, giving Earthbound viewers a 360-degree “tour” of the Occator Crater may be viewed on this page, above. NASA scientists have yet to come up with a good explanation for the strange, bright white spots on the surface of Ceres, but as the Dawn spacecraft draws nearer and nearer to the dwarf planet, they expect that some answers may come into focus. 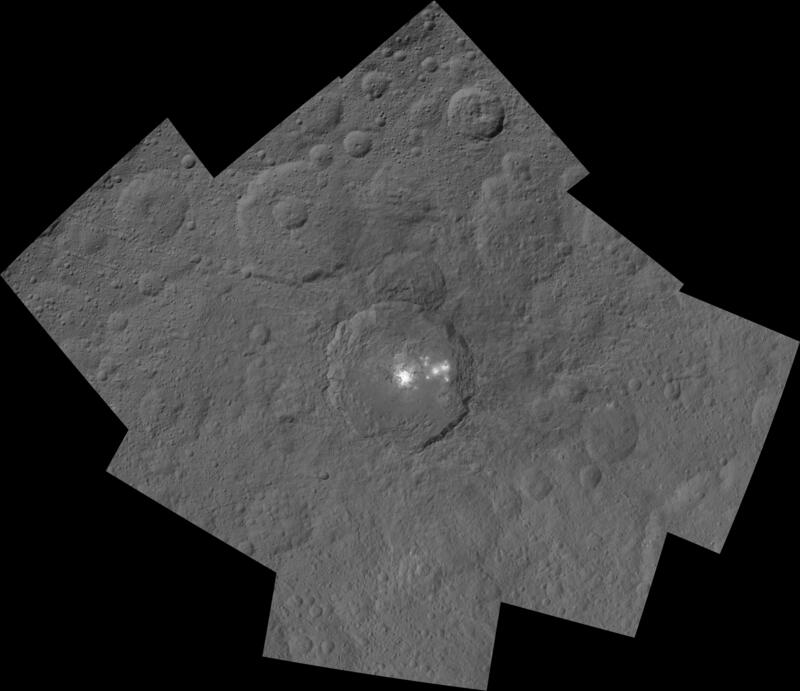 In late July, Dawn had lowered itself to an orbit of about 2,400 miles above the surface of Ceres, which is believed to be the largest of the thousands of asteroids in the solar system’s asteroid belt that orbits the sun between the planets Mars and Jupiter. But using his own photographic software, UFO Sightings Daily editor Scott C. Waring — the man responsible for either making or publicizing dozens of similar “discoveries” in NASA inages such as the “moon-size” alien ships seen orbiting the sun, and “alien cities” supposedly found on the surface of the moon — enhanced the Sawn spacecraft photos and now says that he has seen that they reveal some kind of an “tower” in the Occator Crater. Presumably, the structure, if indeed it exists, would be of alien origin. “Looking back at Ceres I still wonder about the glowing structures. There were a few new photos and I decided to try my best to get something out of it. I used and abuse my photo program until this object came out. Now I didn’t do anything except add darkness and sharpening,” Waring wrote on the UFO Sighting Daily blog. NASA scientists say that at one time, Ceres was a full-fledged planet in our solar system, and in addition to the intriguing bright spots, the celestial body contains a number of other remarkable features, including what NASA has described as a “pyramid,” actually a giant mountain on the surface of Ceres. Given the mysteries of Ceres that seem to baffle even the finest minds NASA has to offer, could the “discovery” made by one, individual UFO researcher be dismissed out of hand?